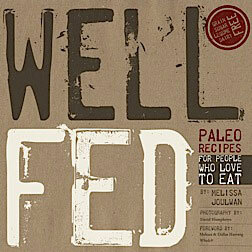 I’m quite fortunate to be friends with Steph Gaudreau, the beauty, brains, and brawn behind Stupid Easy Paleo. 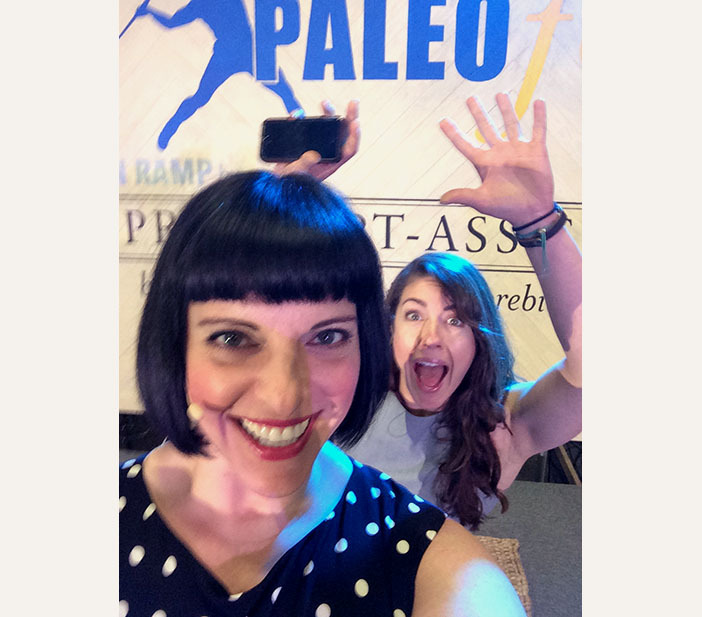 Way back in April, she and I gave a presentation at PaleoFX on how to make paleo more manageable and more fun. Our goal was to romp through our 20 slides in 40 minutes: no filler, all meat. We each delivered half the presentation, and that’s how you’ll get it online, too. The first half is below, and the second half is on Steph’s site. Here’s the gist of what we said. Keep it simple at first. 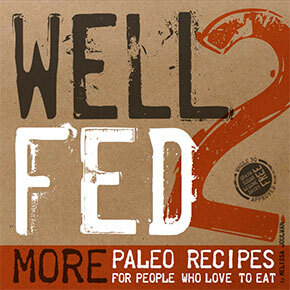 There are (obviously) tons of wonderful paleo cookbooks out there, but in the beginning, I recommend you keep it simple. 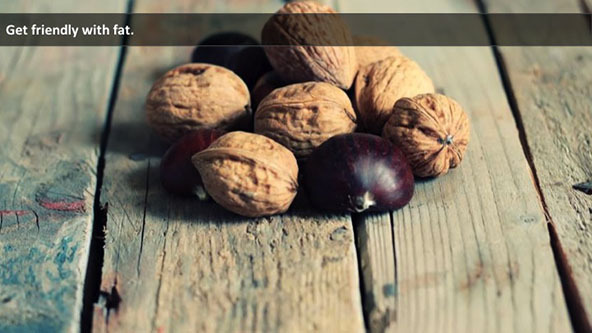 Focus on really great protein, veggies and fruits you love, and a variety of luscious fats. 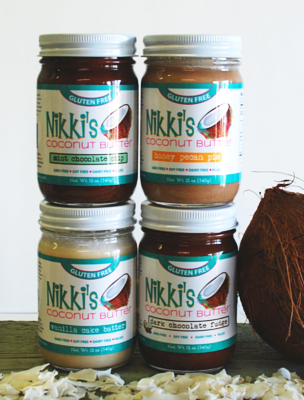 I have a friend—let’s call her Shirley—who decided to give paleo a try. She’s the kind of person who does everything with 100% commitment, so she researched recipes for her first week. Twenty-one recipes: 3 meals a day for 7 days. Then she made a massive grocery list to buy all the ingredients, made an epic grocery store run to multiple stores, put everything away into her kitchen… and collapsed in the fetal position on the couch. It was all too overwhelming, and she was very, tearfully, discouraged. So keep it simple in the beginning. Make some Hot Plates. Grill chicken with a roasted sweet potato and salad on the side. 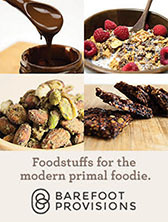 Get your feet under you and relax into the new habits before making yourself a paleo gourmet. Loving Reminder: Even in this world of Instagram, Twitter, Facebook, and more, no one can see your food if you don’t show them, so if you want to eat a can of tuna, a hard-boiled egg, a tablespoon of almond butter, and an apple for dinner, go for it. 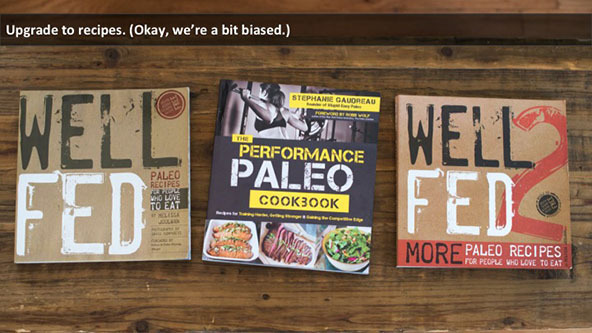 There are no Paleo Police, and no one really cares what you eat for dinner. You’re going to need a lot of veggies. Surprise! Paleo isn’t just about meat. It’s also about veggies and lots of ’em. 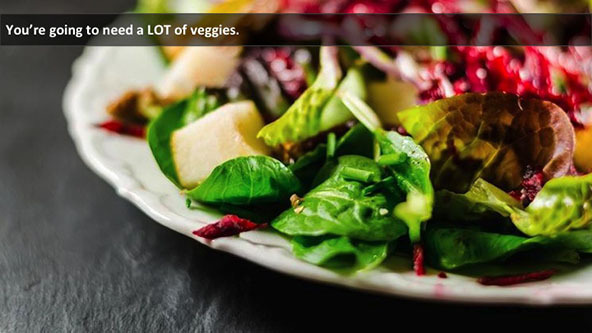 It’s a good idea to eat 1-2 cups of veggies at each meal. You can do the math, but I’ll help you out: That’s about 6-8 cups of veggies per day, per person. You can make it easier on yourself by relying on a mix of frozen and fresh veggies, and by eating them both raw and cooked. That way you get variation in texture and you don’t have to spend all of your free time chopping and cooking vegetables. 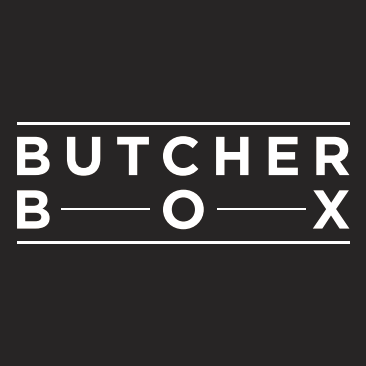 As much as possible, it’s a good idea to eat locally and in season, but you don’t have to make yourself crazy doing it. This is an area where “good enough” really is good enough. I recommend that you buy organic/local versions of the Dirty Dozen, but with the Clean 15, it’s OK to buy conventionally grown, if you prefer. Loving reminder: About half your plate should be veggies. You’re going to need a fair amount of protein. Despite what I said about vegetables, protein really is the basis of your meal, and you need about 4-6 ounces per person at least three times a day, but more if you’re very active. Here’s a short-cut for eyeballing since you probably don’t want to carry a scale around with you to weigh your meals: A piece of protein that’s the size and thickness of your palm is about right, but if you’re lifting lots of heavy things or doing CrossFit, you might need a bit more. Meat quality: Factory farming damages the environment and produces animals that are not optimally healthy, which means they also make us less healthy. 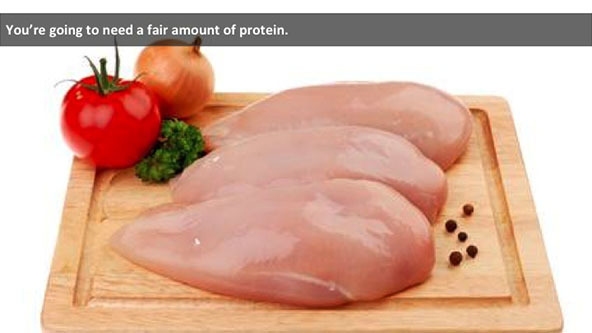 I encourage you to buy the highest quality protein you can afford. If you can’t invest in grass-fed meats, buy the leanest cuts you can find, remove excess fat before cooking, and drain the fat after cooking. Loving reminder: Protein at every meal, every day. Fat is an essential part of good health, and it’s delicious. Double win! Fat makes our food taste good, and it’s good for us. Anywhere from 30-60% of calories our calories should come from fat; that’s about 1-2 tablespoons per meal, depending on what else you’re eating. For example, if you’re cooking the aforementioned chicken breast, you’ll probably want to add some ghee or olive oil. But if your dinner consists of pork spare ribs, you probably don’t need to add extra fat. In addition to making your food taste great, fat also helps you look and feel amazing: shiny hair, clear skin, satisfaction when you eat, steady energy, sound sleep, and improved body composition. Loving reminder: Praise the lard! Once you’ve conquered the basics, it can be really fun to move on to paleo recipes. I recommend a weekly mix of “ingredients” dinners—like roasted chicken with a baked sweet potato and veggies, or a ginormous salad with sliced steak—and more complex recipes that excite your tastebuds and inspire your creativity in the kitchen. There are tons of resources online, but read ingredients lists carefully because not all online recipes are compliant with the paleo or Whole30 guidelines, no matter how they’re labelled. Loving reminder: Give yourself permission to eat the same things over and over if that reduces your stress level. 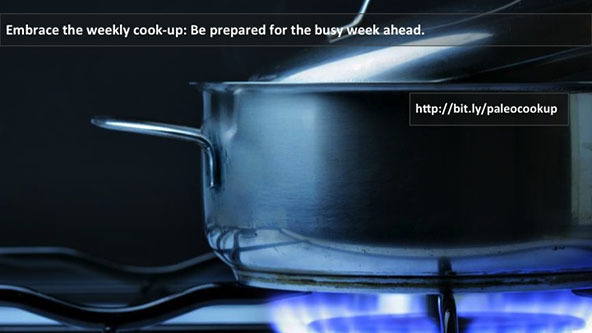 It’s no secret that I think the Weekly Cookup is the easiest way to preserve your good humor about your diet while setting yourself up for success each week. The basic idea is to cook “raw materials” so you can make meals on-the-fly and to cook a few recipes to spice things up. Then, if I craving something special—like Pad Thai or Italian food— I’ll throw that into my Cookup, too. I provide more detailed instruction on how to do this in Well Fed, and this 1-Week Food Plan tells you step-by-step how to make food for a week. Loving reminder: Preparation is the best insurance against an emergency food delivery order! Having said that, social media can also become stressful when we compare ourselves to others, so if your apt to feel less than when faced with others’ successes—perceived or real—you might want to approach social media channels thoughtfully. And remember: The world is a bountiful place. Someone else’s journey does not minimize, negate, or change yours. 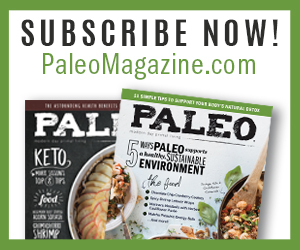 I also find that reading Paleo Magazine or re-reading The Whole30 or It Starts With Food can rejuvenate my commitment and make me feel like I’m part of something larger than myself. Loving reminder: We’re all in this together. Sleep is essential for literally recharging and repairing our batteries cells. A chronic lack of sleep is associated with increased risk of heart disease and stroke, depression, vulnerability to infection, diabetes, and memory loss, plus—and this is a biggie for a lot of us—the less you sleep, the higher your risk of being overweight or obese. I’m not gonna lie: that last one kicked me right in the ego and was the motivation I needed to make sleep a priority, starting in 2009. I’d been a lifelong bad sleeper, but when I made changes to my diet and my habits, my sleep improved. Now I get between 7 1/2 and 9 hours most nights (compared to 5-6 for the previous 30 years). I tend to judge myself when I get tired. It goes like this, “Why am I tired? I hate being tired. Do other people get tired like this?” and on and on. Then one day I realized that my cat Smudge doesn’t question it if she’s sleepy. 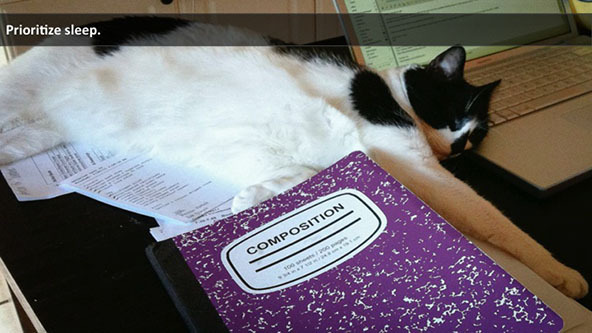 She sleeps… pretty much wherever she is. And yes, I do all of those things every night except the baths. I also recently read a tip from Timothy Ferriss in which he advised reading only fiction before bed. Non-fiction is “future-thinking” and can rev up your brain. Fiction is more present or past-focused and can be more soothing. For more on sound sleep, read this and this. Loving reminder: If you don’t sleep, you can’t be the best you. Give yourself eight hours every night. How freakin’ great would it be if there was a magic formula that everyone could follow to be their healthy, fit, happy best?! It would tell us exactly what to eat and when, and how to exercise and how often. All questions would be answered, and we’d all know exactly what to do. Here in the real world, the basic paleo framework—no grains, dairy, legumes, added sugar, industrial oils—will take us pretty far. But to get to our personal ideal, we all need to experiment on ourselves because we are each a special, special snowflake. There are all kinds of paleo that work for people in and around the basic template: high fat/low carb, ketogenic, moderate, primal, AIP, and the version I follow: Whole30+Becherovka+85% dark chocolate with a heavy emphasis on plantains. 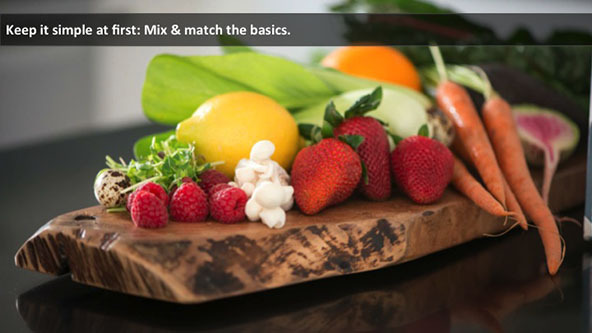 The basic paleo framework might be all you need to be at your best. If that’s the case, celebrate and follow your plan! 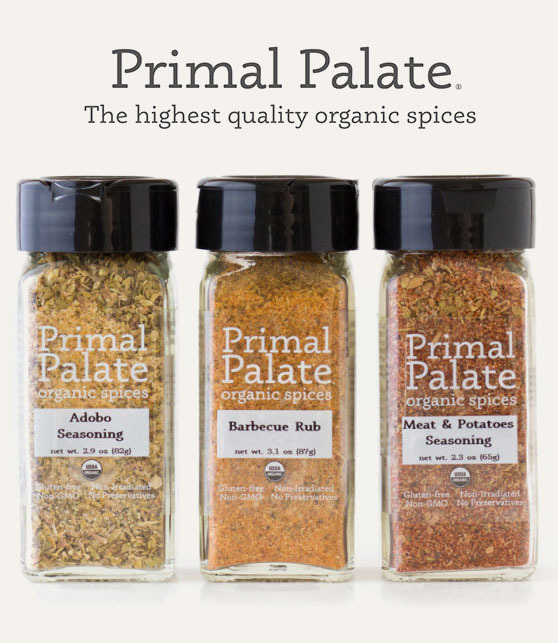 If you have health issues, weight issues, allergies, or other challenges, you might need to tinker a bit to find your own perfect paleo. Some people call it N=1. The best way to know how potentially problematic foods affect you is to introduce them into your diet one at a time and track their effects. The variables to pay attention to include sleep quality and quantity, energy levels, skin, mood, and bathroom habits. 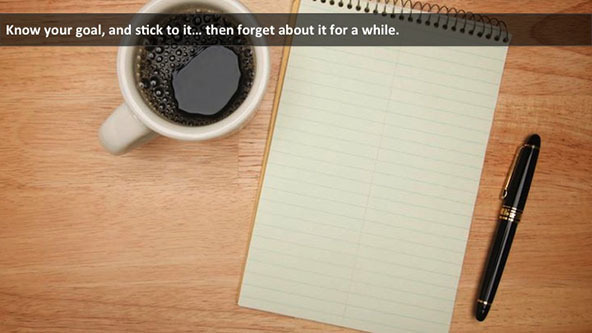 Keeping a journal can be very illuminating. 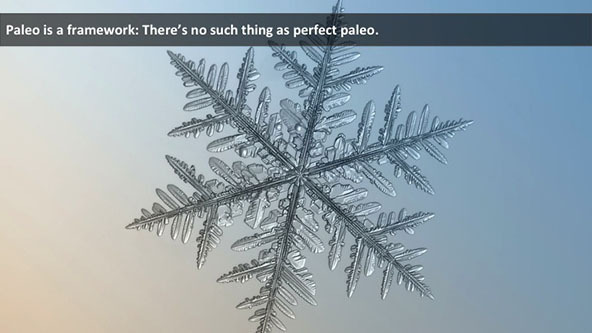 Loving reminder: There are no Paleo Police, and there is no perfect paleo, only the paleo that’s perfect for you. Know your goal — then forget about it. I love to set goals! But particularly where our health and weight are concerned, it can also be a good idea to just forget about the end goal for a while and focus on good behaviors. It’s awesome to channel your energy toward reaching a big, bold something out in the future—and I encourage you to do that—but a true commitment is a big decision to make a lot of the right small decisions. That’s a great place to direct your energy. What’s your goal? Sports performance? Fat loss? Managing a health issue? Mental clarity? Energy management? Just want to generally “be healthier”? You’ll need to adapt your everyday behaviors, depending on what you’re trying to achieve—and those daily behaviors are really the goal. Loving reminder: You’re pretty awesome the way you are, and now you’re just upgrading your awesome. 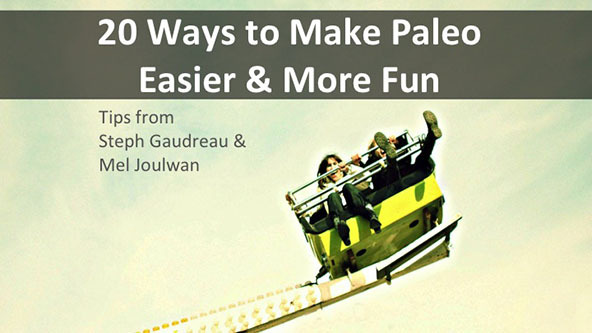 Visit Steph Gaudreau’s Stupid Easy Paleo site for the rest of our list of 20 Tips To Make Paleo Easier and More Fun. 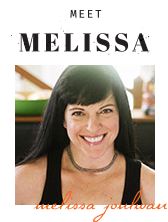 Mel, I love your posts. In a culture where women are still beating themselves up for not conforming to some illusive and unattainable model of perfection, you lovingly and constantly remind me/us that who we are is A-OKAY. Thank you! You’re very kind. Thank you for the lovely compliment! HA! That was a fun day. Hard not to smile when I’m around Steph Gaudreau. I’m glad this is giving you a boost! Wishing you all the best. I started a Whole30 today, too! Never a bad idea to have a little spiff up. Love this! 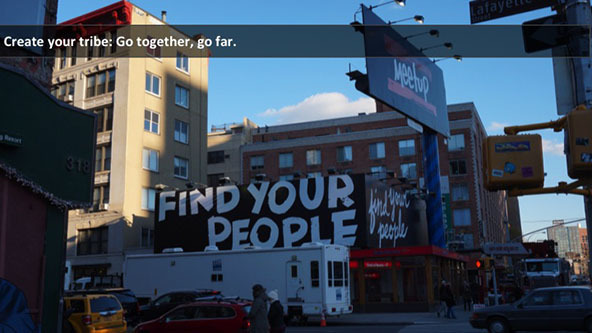 And such a great one to share with others, especially people just getting started…or unsure where to start. My favorites are keeping it simple, planning a weekly cook-up, and remembering that it’s a framework–not a one-size-fits-all set of food rules. Fantastic post! So glad you like it! I agree: Keep It Simple is my favorite. When I get busy or stressed, going back to basics is so soothing and relaxing. Food doesn’t have to be fancy or complicated to taste great. People HERE are always surprised that I like Becherovka, too, but I really do.